Set of 2 Propane Tank Decals – These extended life vinyl decals are 2″ x 3″ for easy application almost anywhere on your tanks. 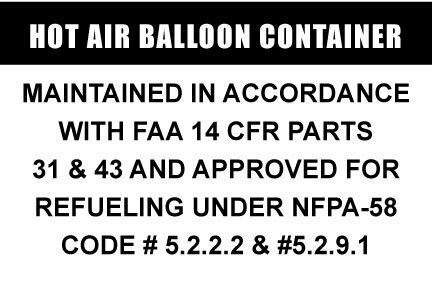 The new NFPA-58 LP Gas Code Manual might affect how balloonists refuel their hot air balloon propane tanks. It was possible that a LP dispenser or local fire marshal could deny LP gas on the basis that there is no code reference or DOT acknowledgement. 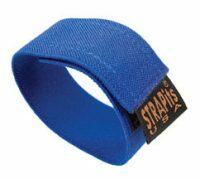 The BFA stepped up and made certain that HAB’s were included in the code. The result is that Code 5.2.9.1 stipulates that all containers (tanks) for hot air balloons shall be marked to demonstrate compliance with FAA regulations. These decals fulfill that requirement. Please familiarize yourself with all of the requirements.